The pit looks like a passage to the underworld. Rimmed in black rocks and ringed in ash, the tent-sized hole gapes with a certain menace. But this is not a passage to the underworld. It’s an oven. We are at an unnamed mezcal distillery high in the mountains of Oaxaca, Mexico. 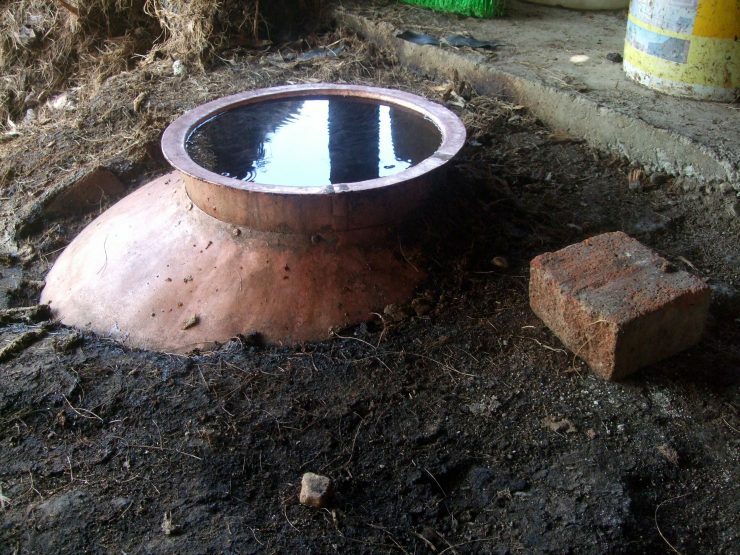 The tiny distillery consists of a dirt yard, the pit, and a shed that contains an old copper still, a holding tank brimming with fermenting agave fiber, and an immense stone wheel. Beyond the enclosure, fields of spiky agave, or maguey, stretch up into the forested slopes. This yard is one of hundreds of mom-and-pop distilleries that dot the mountains south of Oaxaca City. 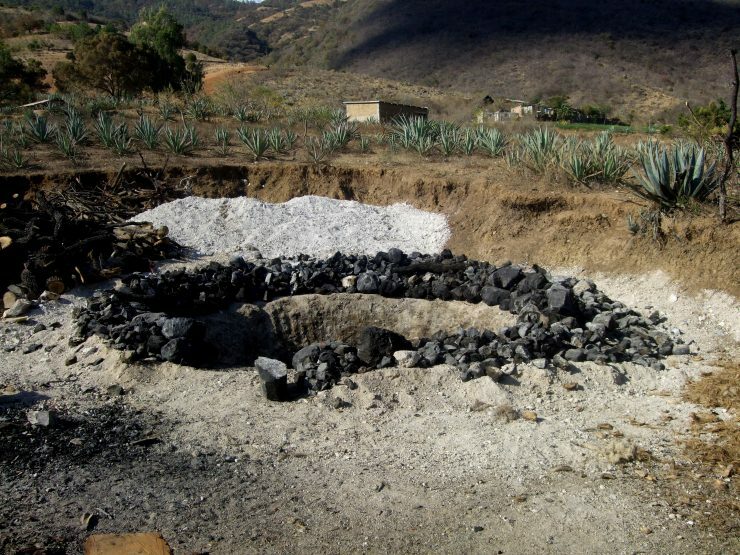 A far cry from the modern autoclaves of the big tequila distilleries, these operations work with fire, dirt, stone, and the age-old art of fermentation. You want artisanal booze? 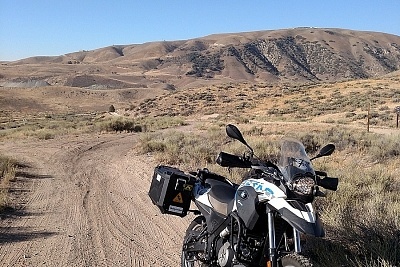 Try something burro-powered. 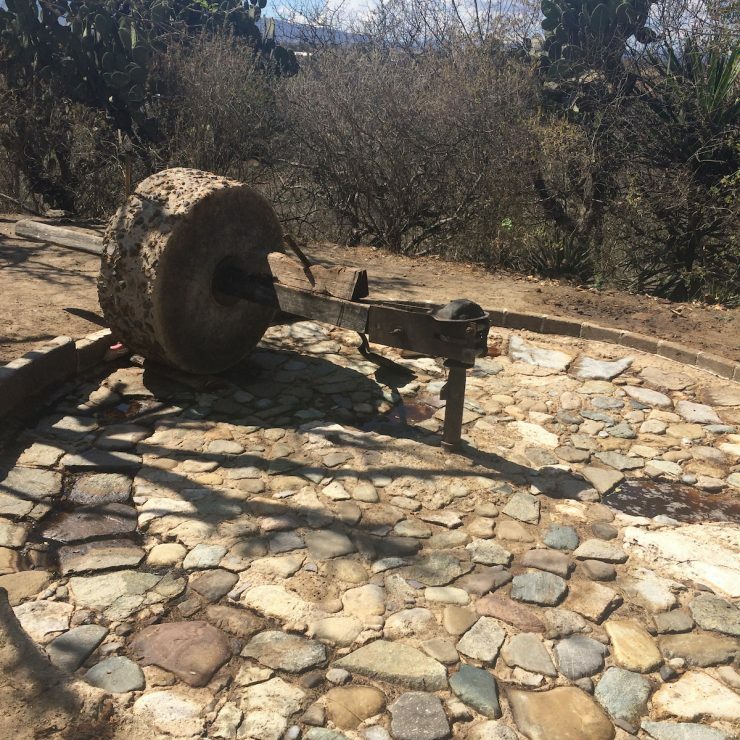 Yes, the stone wheel that crushes the maguey fiber is actually pulled by a burro. 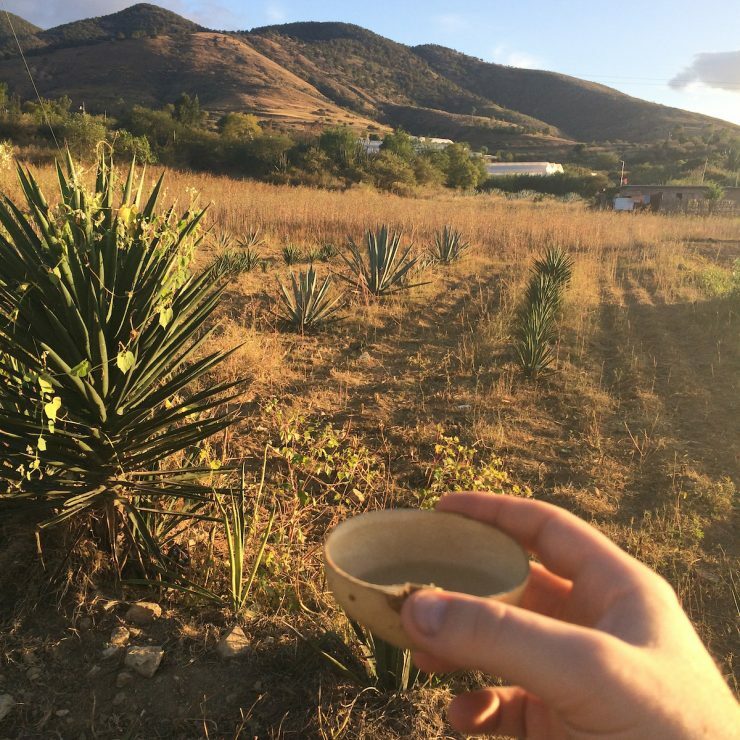 Touring a distillery in Miahuatlan with Clayton Szczech of Experience Mezcal. Traditional grinding wheel. Here’s the process: Men and women harvest agave from the surrounding fields and mountains. Jimadores (professional agave harvesters) cut off the spiky leaves and bury the agave hearts, or piñas, in a giant roasting pit. After roasting for about a week, the smoking agave hearts are removed from the pit and ground to fiber. Next the palanquero (distiller) settles the fiber in vats, where it will ferment for a week or two. At the end of the fermentation period, the viscous liquid is ready for distilling in a copper or clay still. Mezcal is typically distilled twice. Mezcal is a distilled liquor made from the agave plant, a member of the botanical order asparagales, which includes asparagus and narcissus. 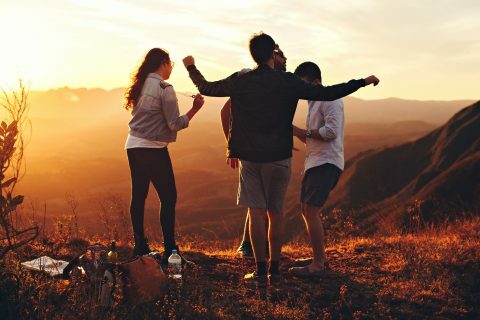 Historically, mezcal was a blanket term for any type of agave spirits, meaning that tequila is technically a type of mezcal, albeit one made in a specific region (Jalisco and parts of four surrounding states) and from a specific type of agave, agave tequilana. Mezcal was once tequila’s wild, unregulated cousin, but these days Mexico has gotten hip to the cultural and economic value of its heritage liquors, and mezcal is now its own denomination, with its own sets of rules, regulations, and certifications. If a bottle is officially designated “mezcal artesanal” and labeled as such, it means that the spirits were made in a specific region by a specific process that may include either pit roasting or the use of masonry ovens. Blanco or Joven — unnaged. Reposado—rested for a minimum of two months in a wooden container. Añejo — rested for a minimum of twelve months in a wooden container. 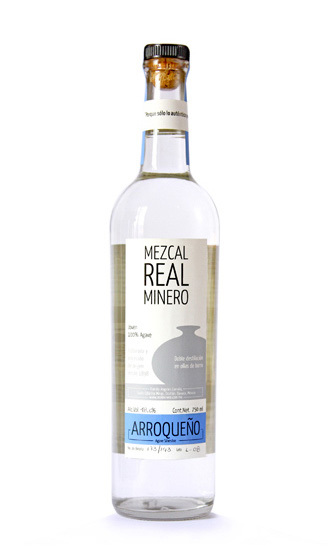 Abocado con — mezcal that directly incorporates additional ingredients for flavor. 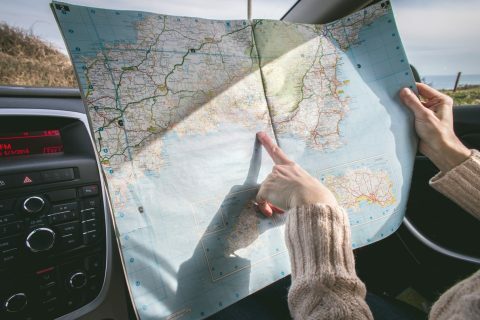 See fruit, herbs, flowers, honey, vegetables, or insects. Destilado con — mezcal that’s distilled with additional ingredients, which may range from plums to the famous pechuga, or chicken breast. Agave must mature for between four and ten years before harvest, which distinguishes agave spirits from all other forms of liquor. 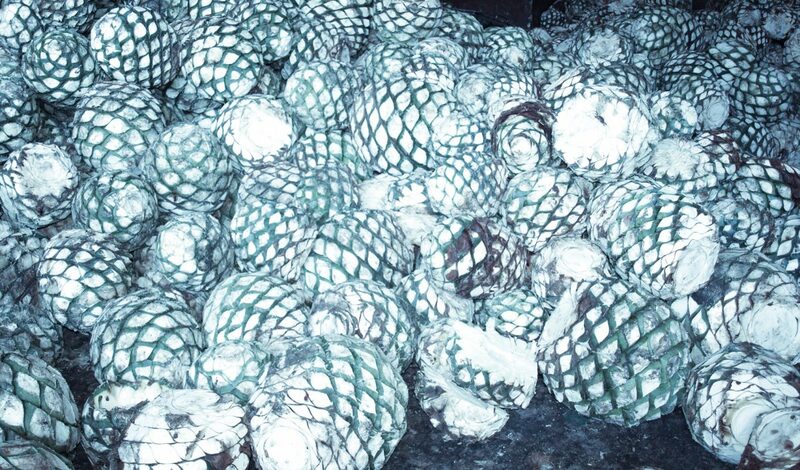 More than any other spirit, mezcal is influenced by the plant itself. 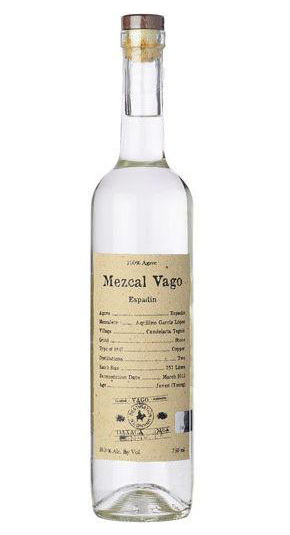 Thus, mezcal labels often reference the type of maguey used in production. 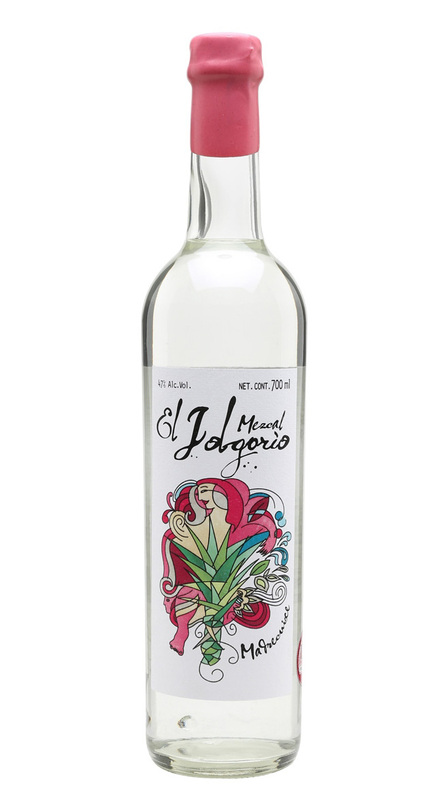 For example, tobala mezcal is made from A. potatorum, a small wild maguey that grows in the extreme highlands. While tobala is sought after, it’s not the holy grail: Tepextate mezcal costs upwards of $200 a bottle because it’s made from a wild agave so rare that a maestro mezcalero might find only five or ten plants in his lifetime. Mezcal was once the drink of Mexico’s working class, and derided as firewater. These days it’s the hippest thing on the menu from Mexico City to Brooklyn. Unfortunately, the boom in popularity isn’t necessarily helping the rural people who make traditional mezcal. Many small distilleries don’t have any way to get their product to a bigger market. Big distributors will pay small distilleries a pittance for their quality mezcal, label it, and then sell it for $100 a bottle. This broad designation covers “mezcal” produced using the same industrial processes that are used by major tequila manufacturers. Agave hearts or juice may be cooked in autoclaves. Crushed by basically any method. Fermented in wood, concrete, or stainless steel tanks. Stainless steel column stills are permitted. Agave hearts may be roasted in an underground stone oven or above-ground masonry oven. 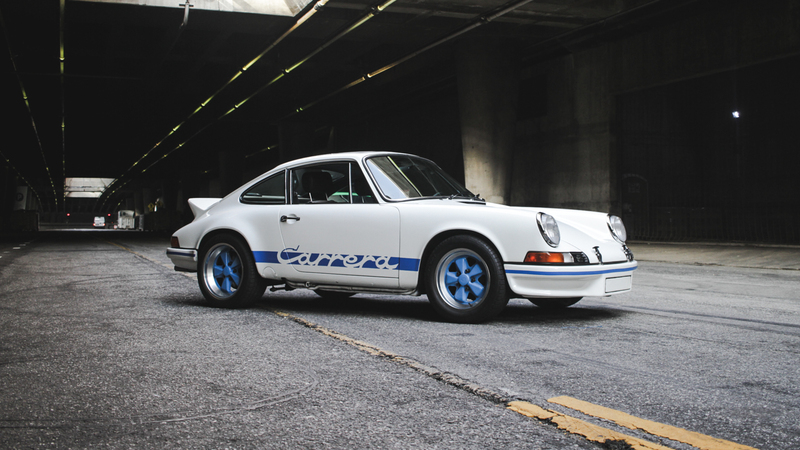 Crushed by traditional or industrial methods. Fermented in stone, earth, wood, clay, or animal skins. Agave fibers mandatory. Distilled with direct fire on a copper alembic or clay pot still. Agave fibers must be included. Roasted in an underground stone oven. Crushed by hand, with a tahona, or with a Chilean or Egyptian mill. Distilled by direct fire on a clay pot still. Agave fibers mandatory. Experience Mezcal indeed! 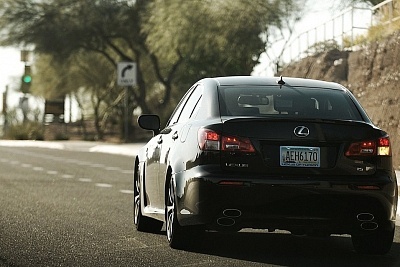 Photo courtesy of Clayton Szczech. We asked renowned mezcal expert Clayton Szczech of Experience Mezcal to weigh in on a few of our favorite brands. In choosing producers for his tastings, tours, and “mezcal camps,” Szczech considered politics as well as taste. “Right now there’s a real need for people to understand why mezcal costs what it does,” he says. “What I’m trying to do is look at these brands and figure out where more of that money is getting back to the producer.” With that in mind, he came up with four recommendations for delicious mezcal that is produced with respect for the environment and culture of rural Oaxaca.